One prong set pear modified brilliant cut natural tanzanite, measuring 14.30 x 10.00 x 7.25mm, approximate weight of 7.40ct., clarity is eye clean, type I, medium dark, moderately strong, cut is good. Clarity is eye clean, medium dark, moderately strong, blue violet color, (GIA BV), cut is good. Transmitting light with no distortion, transparent. EGL Report attached. Graded in the EGL Laboratory, Report #1.1S 65664401C. Tanzanite is a very rare gemstone that is only found in the country of Tanzania. Originally discovered in 1967. Tiffany and Company, named the stone Tanzanite. It is found in the Usumburu Mountains that border the Umba Valley of northern Tanzania. Tanzanite occurs in gray, brown, violet, blue, reddish-purple and green. The gem is interesting because of its exceptional pleochroism. Rotated in different directions a tanzanite will exhibit multiple changes of color. 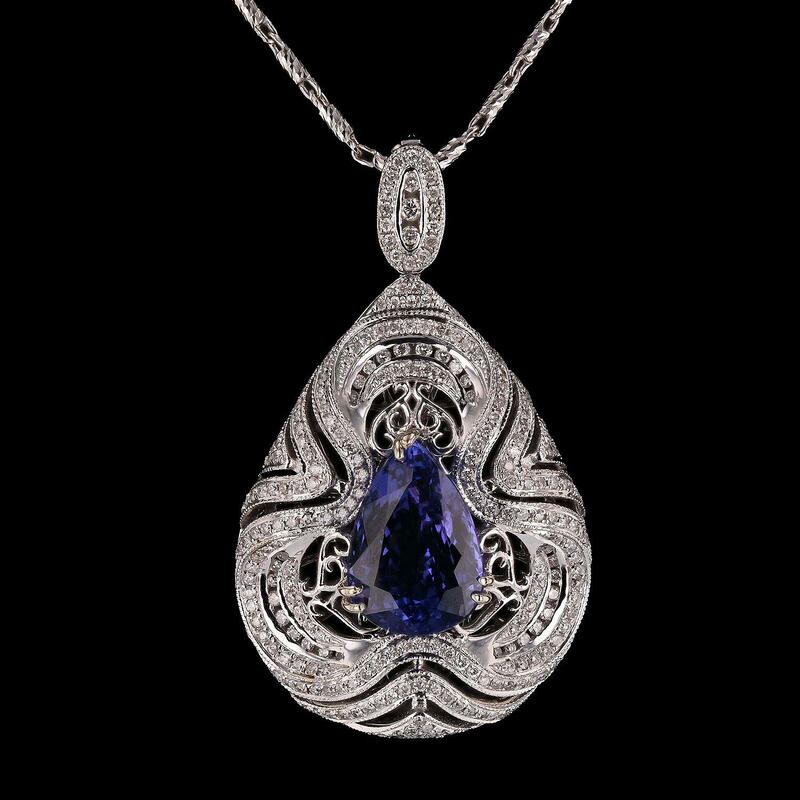 Tanzanite has a low tolerance to ultrasonic cleaning, and should not be cleaned using this method. Two hundred eighty-four prong set round brilliant cut diamonds approximate total weight of 284 Stones = 1.22ctw. EGL Report attached. Graded in the EGL Laboratory Report NUS 65664401C..
Total Weight of Colored Stones 7.40ct. Total Weight of Diamonds 1.22ctw.